Dry Season or Wet Season? 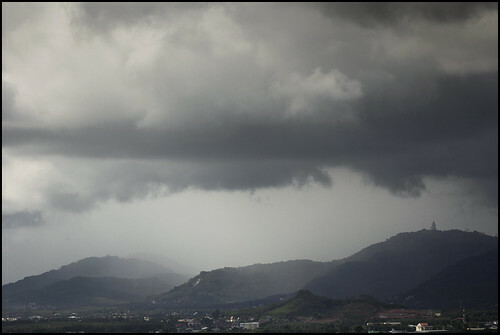 Every year I see visitors to Phuket who are surprised that there's rain falling in high season. Surely November is the dry season? Why is it raining? WHAT ARE WE GOING TO DO? Firstly, don't panic, especially not with rain like we're having this week. It's mostly light rain, with some heavy, short showers thrown in, but the sea is calm, there's no wind, as William Wallace said in Braveheart "It's good Scottish weather, the rain is falling straight down". 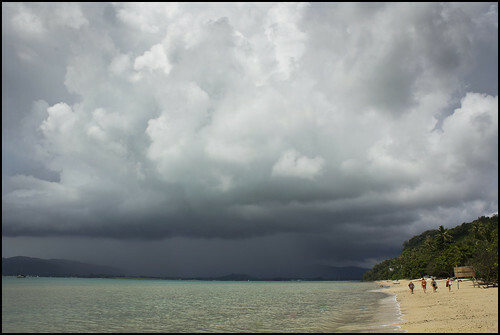 But in Phuket, the rain is warm, the air is warm and really all you need is a small umbrella to get out and enjoy life. Sure you can't sunbathe, but guess what? There's more to Phuket than beaches! My Jamie's Phuket blog was started back in 2006 to show the many sides of Phuket. Rainy day? Please don't sit in your hotel and stare at the rain! Go and do something interesting like visit a museum (Phuket has several good ones), take a little walk (with umbrella) in old Phuket Town, go for a massage, visit the aquarium, go eat some seafood, visit a temple, hey even a tour in Phang Nga Bay will be fine in this weather since the sea is calm, just you might get a little wet, but don't worry, you won't melt. (above) view from Rang Hill, Phuket Town on Saturday 24th November looking towards the western hills and the Big Buddha. See? Rainy day, great view! Take a drive, get out and explore... wasn't raining on us at Rang Hill.